I love Christmas (as you may have noticed) and I thought that it would be the perfect opportunity for made up of little things' first giveaway! If you fancy winning yourself a Christmas present from me, all you have to do is leave a comment on this post telling me what has been your favourite post on this blog and any requests for posts you'd like to see. That's it! Ahhh I'm a new-ish follower and followed because I love all your posts, this is so hard!! I love all the Christmassy ones as I am as excited as a 5 year old for chrimbo, but I remember your 'Bonding Experience' with your Discovery made me laugh as I had a similar situation, so it would have to be that one!! I njoi reading all your posts. They are very refreshing and relatable for me. But if I had to choose, I would say the 'a day at home'. Reason being i was on my core leave too and your post made me appreciate the blessing of my cozy Lil home. Ooooo I love Liz Earle! I think my favourite post you have done was 'Mouse's STory', it touched me so much. So sad yet so nice too. Thank you so much for this give away :) I love your posts when you update us on how your new house is coming along. Its so wonderful to see something so special come together so nicely. I will be looking forward to the day you guys first move in. Also, I love your beauty posts :) Keep up the good work. My favourite post has to be the recipe for red onion marmalade as it has gone down an absolute treat in my house. I love the posts on the work you're doing to the house and also ones based around your rural lifestyle as it makes your blog so unique. Oh fab prize. I've never tried it myself, but love to use it. I loved reading how your house came along. I love renovation projects, new builds and seeing how a house becomes a home, so these posts were the most interesting for me. I love reviews! The blogging world is so inspiring sometimes! Fab giveawy :) Merry Christmas! I'm a new-ish follower, directed here by the lovely Charlotte from Charlotte's Web. 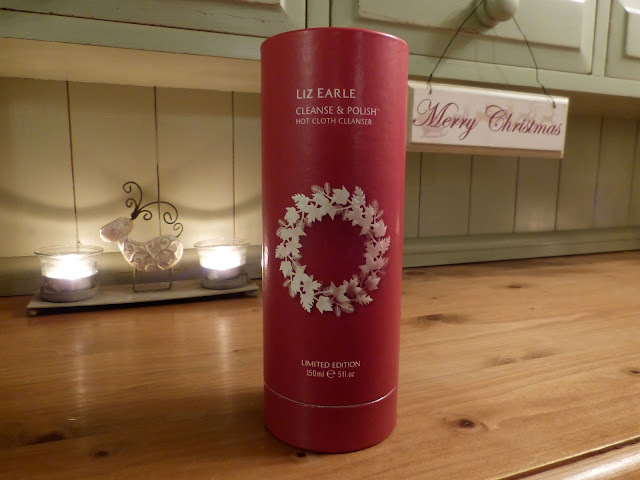 I heard lots of great things about the Liz Earle Cleanse & Polish but they sell them where I live. I think my favourite post has to be the Friday Roundups. Living in a tropical city, surrounded by the concrete jungle, can be a bore sometimes. Seeing all the pretty snippets of an English countryside has a way of perking me up, especially after a long week! So I'd definitely love to see more of that. (: Hope you're having a great day! I've been thinking of starting one. But I haven't gotten around to it yet! (and to be honest, it's a little intimidating to put myself out there) Such a nice surprise to find a reply from you. It made my day (: I just love your blog! And yours too Rachael!! I love all the different aspects of your blog, from renovations, recipes, beauty, animals and of course the Friday round up. The post about your Discovery made me chuckle! I live in deepest rural Devon and our house has been a big renovation project for the last 13 years so I can relate to the ups and downs of country life in a building project!! I personally would like to see more posts with pictures of the country side, i live in city, so i miss the landscape beauty. I really like your friday round-ups. It looks like a little story or something when you look at the pictures. But I also really liked the post with your recipe for apple-chutney. I'm going to give that a go one of these days.. I do like food posts so maybe you could do some where you take a picture of what you've been eating the previous week or something. And thanks for giving your readers a chance to win something nice! I can't make my mind up! I am torn between your Family Traditions - Lake Windermere post, and your Mouse's Story post, both of which had me nearly bawling with their loveliness. I also love your Friday Round-Ups though. I haven't answered your question with a straight answer have I? I have been reading your blog since September! Every Friday I always look forward to sitting down, cup of Tea in hand and reading your Friday Round up posts! And of course, the slow cooked Spaghetti Bolognese post you put up, i tried the recipe myself and thought it was lovely! Perfect for cold nights like this!! My favourite blog post was the one dedicated to your wee kitty, Mouse. Brought a tear to my eye, but was lovely to read. One of my cats - Huggles (Ahem. Yes, named when I was about 11, seemed a good name at the time...) - passed earlier this year. I think time is the only healer. Adore all your posts though! As a city girl it's nice to get an insight into country life. I absolutely love your Friday Round Up's! Keep doing what you're doing...it's a great blog and I love it! Your recipes are great too. Hello, my name is Charlotte and I would like to enter your giveaway. I hear you are very nice. I like posts that you have written. Follow me and I'll follow you? Hahaha, I'm going to stop now before I get sent to spam by blogger. Hi please can I enter your giveaway? My favourite post of yours was the Christmas traditions ones. That is because I really know how you feel about trying to make new traditions for Christmas and them not feeling quite right. We moved to England so many years ago but still celebrate on Christmas Eve like most people in Germany. But trying to have Christmas on the 25th never felt right because not only was it my sister's birthday (try explaining to a four year old why suddenly everyone is getting presents on her birthday) but we've also had to concede that going to our local church before we opened our presents wasn't right either as it isn't our practised branch of Protestantism. We realised as well that visiting family over in Germany was to stressful and caused to much bitterness between my grandparents. Now we have our own Christmas that is just between the four of us at home. And it is perfect just the way it is. What I'm trying to say with this abnormally long comment that the posts really spoke to me, and confirmed to me that just because things change that the traditions that you enjoy are the ones worth keeping. My favourite post of yours are the friday round ups! ahh it's too hard! I don't have ONE favourite post but I think my favourite ones are your Friday Round Up! I've only recently started reading your blog after seeing it mentioned on Amy's 'Blogs I ♥' page over at 'alittleboatsailing', but it's such a lovely, cosy little blog that I know I'll check back again and again. I don't have a blog of my own but it's blogs like yours which inspire me to maybe start up one when I have a bit more time. Anyway, to the competition - my favourite blog posts of yours have to be the 'Christmas Traditions'. Recently, things have been pretty hard at home for us and none of us have been feeling very christmassy at all, but reading those two posts of yours really made me smile and just be glad for the things that we do have as a family, rather than sad for the things that we don't. It's always nice to hear someone else's viewpoint on Christmas and, this year, yours has made me determined to put all of the bad things to the back of my mind and to just enjoy Christmas together as a family, no matter what. Thank you.